Formed in Cincinnati, Ohio in 1999, The National have received widespread critical acclaim for their music, right from the release of their very first album. In recent years, that critical acclaim has gone hand in hand with much commercial success too. The National is comprised of vocalist Matt Berninger and two sets of brothers, Aaron and Bryce Desner and Scott and Bryan Devendorf. The band's sound has been influenced by a diverse mix of musical styles including indie rock, Britpop and country-rock. The National's self-titled debut was released in 2001, followed by Sad Songs for Dirty Lovers in 2002. Both of these albums received praise from the music press. Their third album, Alligator, was included on many album of the year lists and sold in excess of 200,000 copies worldwide. The year 2007 saw the debut of The National in album charts across the world with the release, Boxer, which had tracks featured on hit television shows including Chuck, One Tree Hill and House. The band has also recorded songs for the TV series Game of Thrones and Boardwalk Empire. 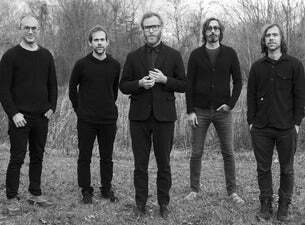 The National released their seventh studio album, Sleep Well Beast, in September 2017 and toured the UK throughout September to celebrate. The band announced summer dates at Manchester's Castlefield Bowl in July, Barclaycard British Summer Time 2019, where they'll co-headline with Florence and the Machine on 13 July and Summer Nights in Glasgow for two nights in August. The five-piece are set to release their eighth studio album in May 2019, entitled I Am Easy To Find. In addition, the band released the single You Had Your Soul With You, and will perform five special shows in April 2019, in Paris, London, Toronto, LA and New York. The London date will take place at the iconic Royal Festival Hall, Southbank.